Graphene is a waste of money, a very senior British professor told me last year during a conversation about government funding for science. It might be useful to a few applications, he complained, but graphene will never be revolutionary: the technology is too limited - it is interesting but not a game changer. We were talking a few months after the Chancellor George Osborne had allocated £50m to graphene research. The year before, Andre Geim and Konstantin Novoselov of Manchester University had won the Nobel Prize for Physics for their pioneering work on the "miracle material" and the funding was a vote of faith in an exciting new area of research. Another £11m followed just after Christmas. Graphene is the name given to a novel substance composed of a single layer of carbon atoms, extracted from graphite, with astonishing properties: the stuff is stronger than diamond, more conductive than copper and more flexible than rubber. However amazing, more than £60m is a lot of money to pump into one particular area of science in an age of austerity and researchers in other subjects are always bound to quibble, at the very least. In the clamour for funding, resentment is not unusual, particularly if the money appears to be aimed at one specific project rather than a whole field of fundamental research which may deliver far more in the long run. The objection is to what could be called the Concorde syndrome: public money being hosed at a single project, in that case a supersonic passenger plane, admired for its beauty but limited in its possible uses. But graphene is different and has caught the eye of the British government - and other governments and companies - precisely because its potential benefits reach into an extraordinary range of areas. 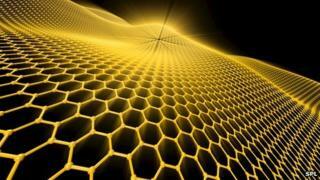 Image caption Could graphene put an end to the problem of rust? Even if it fails to deliver all that is promised for it in, say, electronics, it might still prove incredibly useful in others such as energy or medicine. In a paper in Nature last year, Professor Novoselov and his colleagues outlined a "road map" for possible applications of graphene, exploring whether it could become "the next disruptive technology, replacing some of the currently used materials and leading to new markets?" They acknowledge that many of the material's most exciting characteristics are only achieved with the highest-grade graphene and that industrial-scale techniques for making it have yet to be confirmed. Still, they argue that a long list of applications is plausible. Flexible electronic screens may emerge soonest, with the most appealing idea being "e-paper". A working prototype is expected by 2015, according to the Nature study, though the costs are still far too high for any marketable product at the moment. The authors acknowledge that the established role of silicon will mean that graphene, which is not a semi-conductor, might not play a part in processors till after 2021. However, they say graphene is so thin that a "paint" could act as a rust protector or an "electronic ink" or be added to advanced composite materials to make them impermeable or conductive or stronger. It could be used to enhance solar cells and to improve the working life of batteries, though a lot of technological barriers still remain. As a material highly sensitive to the environment, graphene could act as a sensor with a single device measuring strain, gas, magnetism or pressure. And its purity and large surface area make it suitable for medical uses too: from aiding drug delivery to building new tissue for regenerative medicine. However, the authors admit that the sheer number of hurdles mean this will not happen before 2030. They recognize that "established benchmark materials will only be replaced if the properties of graphene, however appealing, can be translated into applications that are sufficiently competitive to justify the cost and disruption of changing…"
In other words, the price and hassle of switching to graphene need to make sense financially. So, the paper argues, graphene's "full potential will only be realized in novel applications, which are designed specifically with this material in mind…"
What this means is that graphene is something of a gamble: to really make sense, people will have to dream up inventions for it. The bottom line is that graphene is too good to be ignored and - in some applications - may yet prove to be too good to be true. But a look at the statistics for patents - a key indicator of commercial intent - reveals how many countries and companies are prepared to throw the graphene dice. From a standing start with the Manchester work in 2004, there are now more than 7,000 patents on graphene, with the largest number - more than 2000 - held by China. Samsung alone holds more than 400. Massive investments on this scale can turn sour - plenty of promising technologies do flop. But the greater the level of finance, energy and sheer brainpower devoted to graphene globally, the greater are the chances of exploiting it successfully. The miracle material will soak up a lot of money but, taking a long view, it's unlikely that much will be wasted.